Pictured from left to right are BentSpoke Brewery owners Richard Watkins and Tracy Margrain and Fork and Brewer’s Kelly Ryan. Photo: Supplied. It’s an ‘Ale of Two Cities’ – Canberra is teaming up with Wellington to create a bespoke sister city beer with a memorable name. The respective national capitals have decided to share their craft beer brewing expertise to celebrate one of their many social and cultural ties. BentSpoke Brewery will be doing the honours for Canberra while Fork and Brewer will providing the Wellington expertise. ACT Chief Minister Andrew Barr said that both Wellington and Canberra have vibrant, established and growing craft beer markets, and this new joint venture serves as an ideal partnership to celebrate and strengthen the sister-city relationship. “This opportunity for businesses in each city is an innovative one,” Mr Barr said. “I am sure this process will evolve into a city-wide opportunity for established and emerging craft brewers in Canberra to engage, develop and exchange brews with their Wellington counterparts. On Tuesday (October 16), Bentspoke’s head brewer Richard Watkins and Fork and Brewer’s Kelly Ryan are starting the brewing process which will result in the first production of the ‘Ale of Two Cities’. This first brew will be ready for launch in Canberra by the Mayor of Wellington at the start of November. It will then be launched in Wellington during Canberra Week in mid-November, with a ‘tap take over’ at official events. 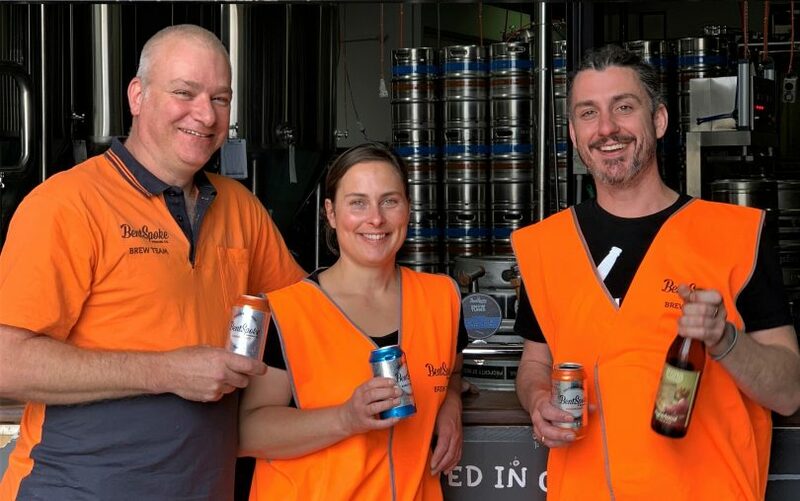 BentSpoke owners Tracy Margrain and Richard Watkins said that their company is excited to enter into a collaboration with a New Zealand brewer to promote the Canberra/Wellington partnership. “We have always been passionate about promoting Canberra and it is great to think that beer can be a product that brings these partnerships together,” said Ms Margrain. Fork and Brewer’s Kelly Ryan said it would be “awesome to be able to bring a little piece of Canberra to Wellington”. “Richard and Tracey at BentSpoke are known as some of the best in the business and to be able to work with them is such an exciting proposition,” Mr Ryan said.